What a strange year so far! First of all we had a difficult winter when it was wet initially then very cold and an extended winter seemed to go on for simply ages. The cold and wet spring, at the start of the farming year, meant that potato planting was late compared to a “normal” year – I put that in inverted commas because after 50 years of farming, I have come to the conclusion that there really isn’t such a thing as a normal year. After the slow start with the late potato planting, the potato crops grew well, that is, until the drought hit. At the peak of the drought, although the plants themselves still looked well, they had just stopped growing. As can be seen from the photo above, the canopies had not grown sufficiently to meet in the middle of the rows as would be normal. At the roots, there were fewer tubers and these were smaller than would be usual. Thankfully when the hot weather and accompanying drought broke on 26th July and the rain finally came, it was enough to keep the plants alive. Over a month later, our crops were still flowering to some extent and, happily, they had grown in the interim. For us and the rest of the farmers on the Yorkshire Wolds, the rain came in the nick of time to keep the crops healthy. 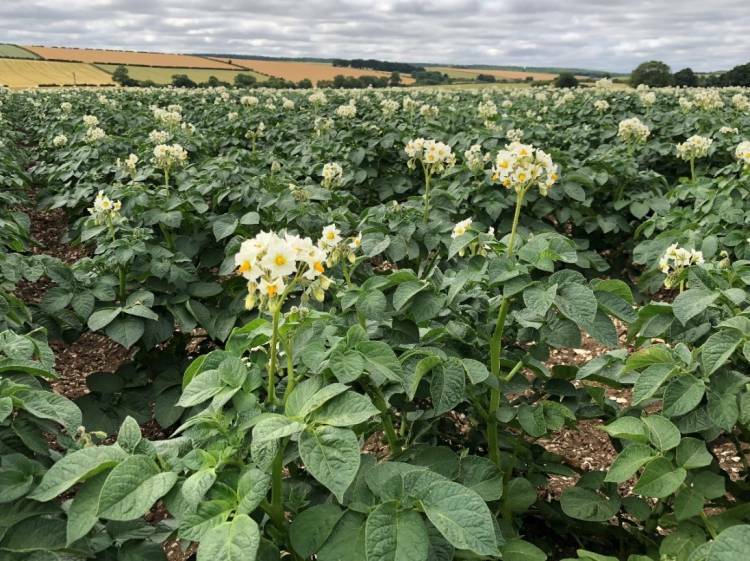 Since then, the potato crops have looked well in the main on the Yorkshire Wolds, even though they had been standing still for some time. What we don’t yet know for these and other later crops is whether the rain has been enough during August to really bulk up the crops sufficiently. This is something that we won’t know for some weeks to come – we are hoping to have a better picture by mid-September when lifting really gets underway. However, the early crops have suffered worst so far because they are dying now simply because they have lived as long as they are expected and didn’t get the rain in time. It is true when we say that we have never seen a season like this one. It is certain that yields will be down, but by how much, no-one yet knows. What has helped is that unusually, potatoes from the harvest 2017 crop have been available for much longer than usual, and this has certainly cushioned the start of this new season in terms of availability. This will also have a knock-on effect for the season. Effectively, 1/12th of the 2018 potato season has already passed, which means that the Harvest 18 crop needs to last one month less than normal. This will certainly go some way to compensate for the loss in yields this harvest. To summarise, we can expect a higher priced year than last year, but it really still is mixed as to the picture which is revealing itself at the moment. We are anticipating a shortage of larger baker sizes but, we remain hopeful that the season in general will not be quite as difficult as feared.